Welcome to Baan Suay Karon Beach, located on the much sought after west coast of Phuket Island. We are within a short walking distance from Karon Beach, one of Phuket’s most beautiful beaches offering 3km of white sandy beach, surrounded by lush tropical forest-covered hills. The spectacular scenery is only matched by the stunning sunsets enjoyed from this west-facing beach. 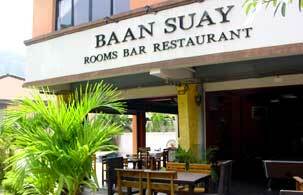 Baan Suay is a family run hotel, offering contemporary Thai-Deluxe, Superior and Family rooms. All rooms feature large beds, large bathrooms with hot showers, in-room safe, mini bar, satellite TV, air conditioning, and daily maid service. On site taxi service as well. You will want for nothing! Start, end, or spend your entire day eating and relaxing in our fully stocked open air bar and restaurant. We serve a full complement of Thai and Western food 7 days a week from 7am to 10pm. Relax at a table and lounge on one of sofas watching TV in the breezy shade or catch up with friends back home using our free desktop computer and internet service. Yes free! Brought your own laptop? Take advantage of our free wireless internet access as well. Spend a lazy day relaxing in the brilliant Thai sunshine at our poolside, sipping one of our trademark exotic cocktails or non alcoholic beverages. Our greatest pride is our lovely, friendly Thai staff, who will wow you with their hospitality and service. Let our local knowledge enhance your experience. 1 Large Bedroom / King size teakwood bed and adjoining balcony with magnificent sunset views.